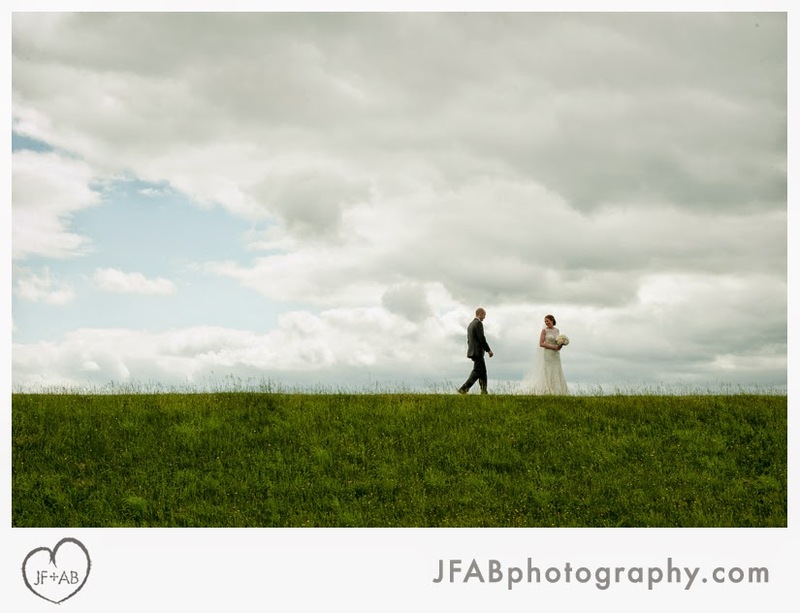 Although I can still remember our first phone call last winter, I (Amber) got to know Julie and Ben at their engagement session a few months ago. 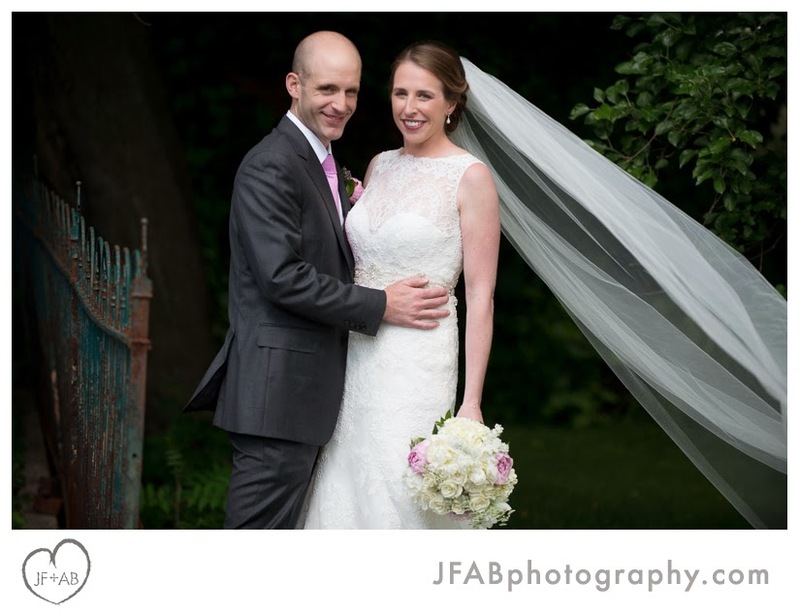 Julie and Ben met in law school years ago. 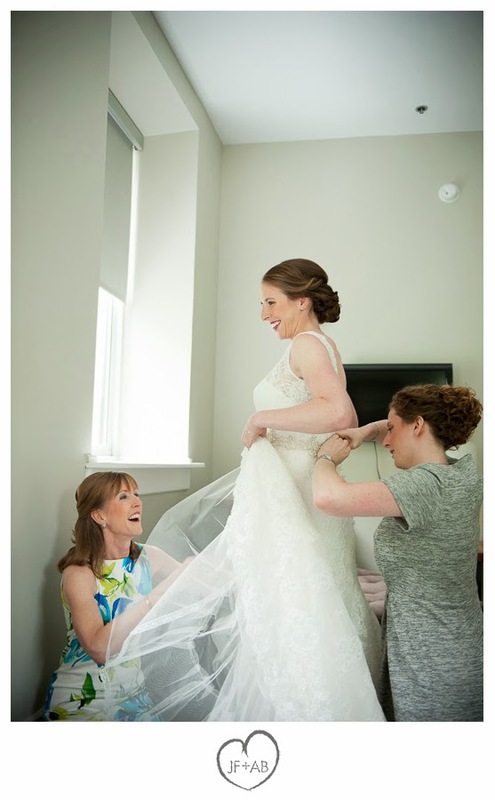 They kept in touch and their friendship grew to something much more. 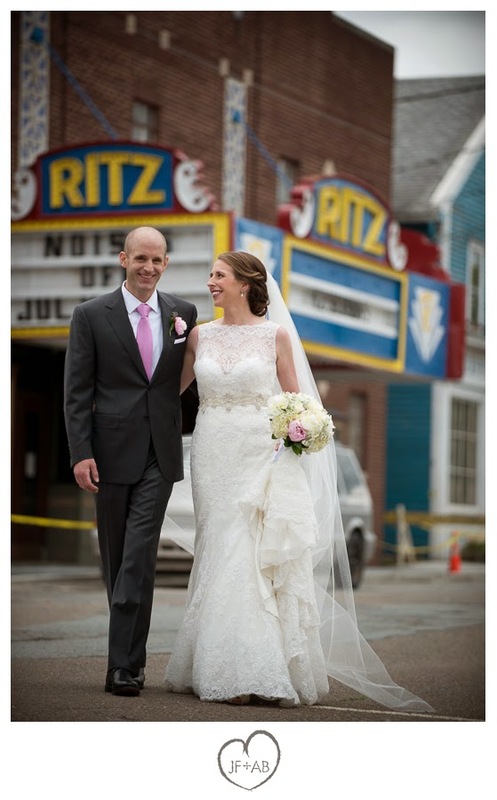 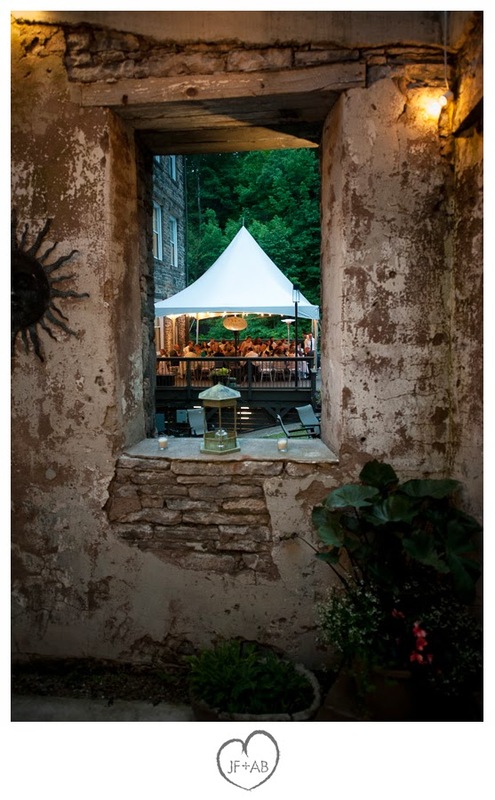 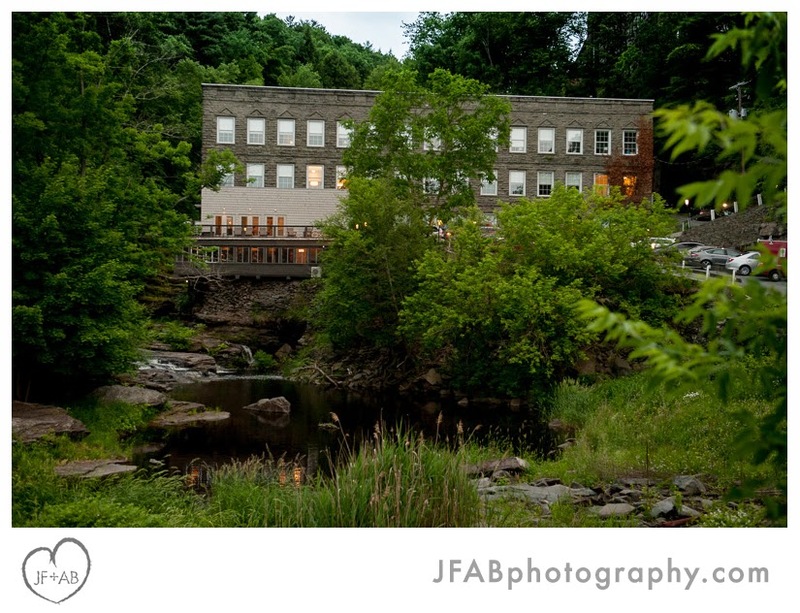 Although they currently live in Philadelphia, they chose Ledges Hotel for their wedding location in part because Ben grew up in Hawley. 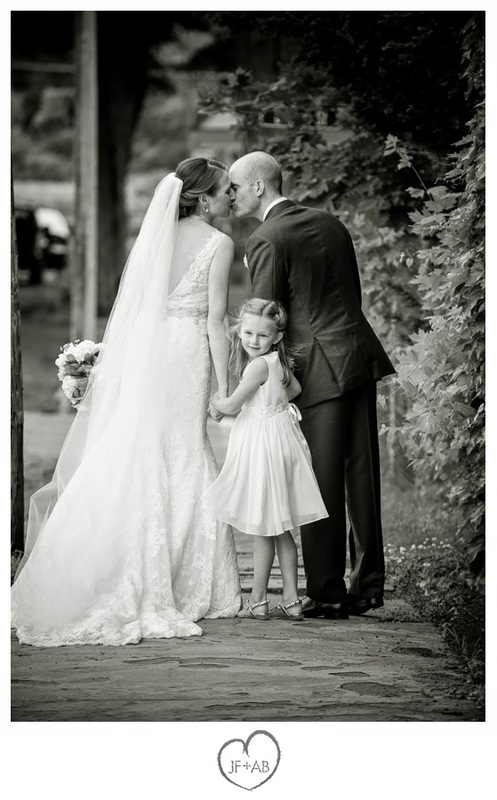 Their event was more than a wedding of husband and wife. 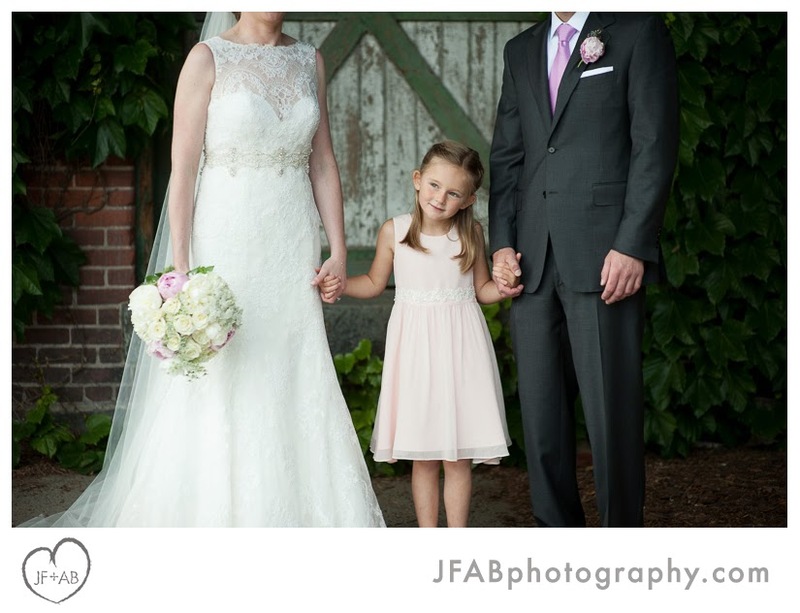 When Julie said "I do," she also promised to be step-mother to Ben's daughter Charlotte. 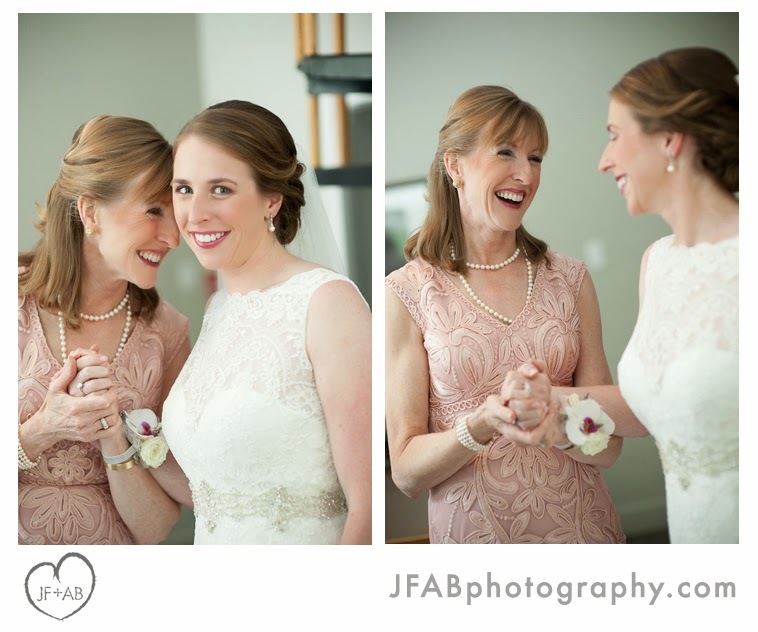 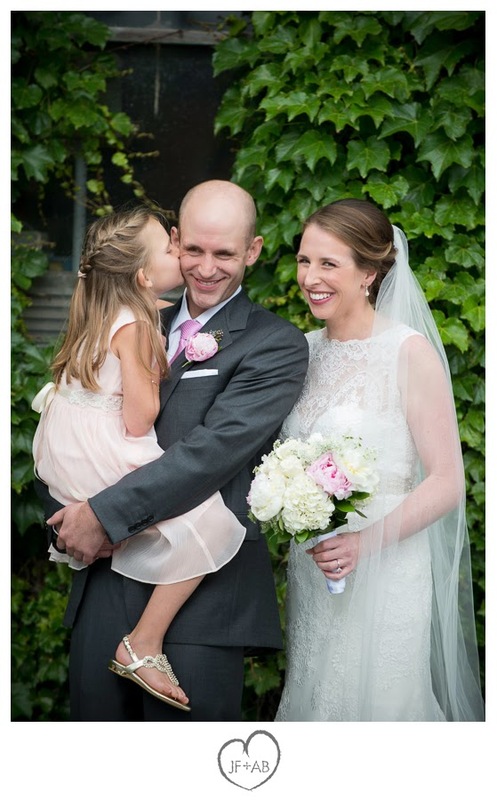 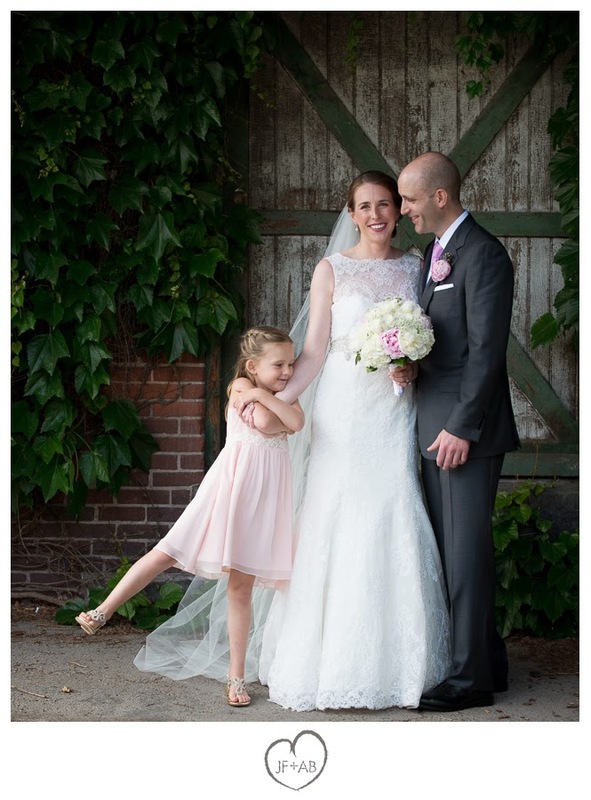 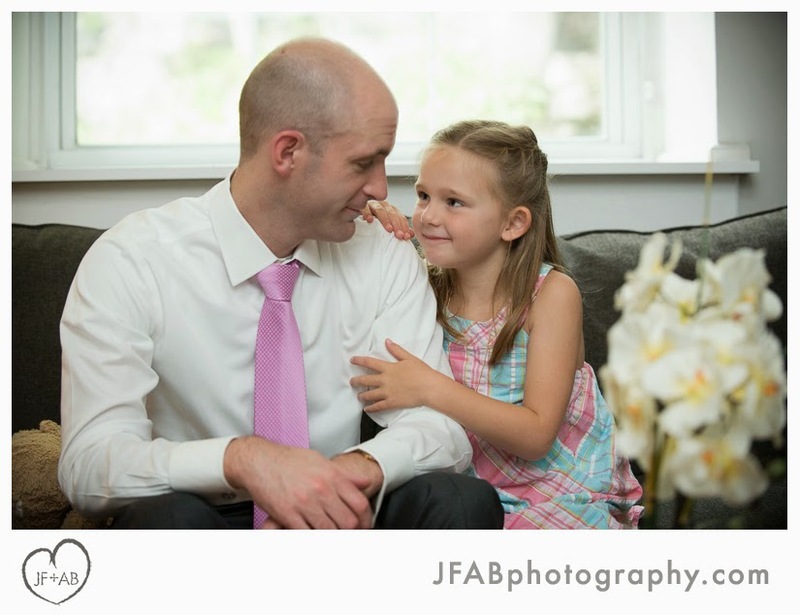 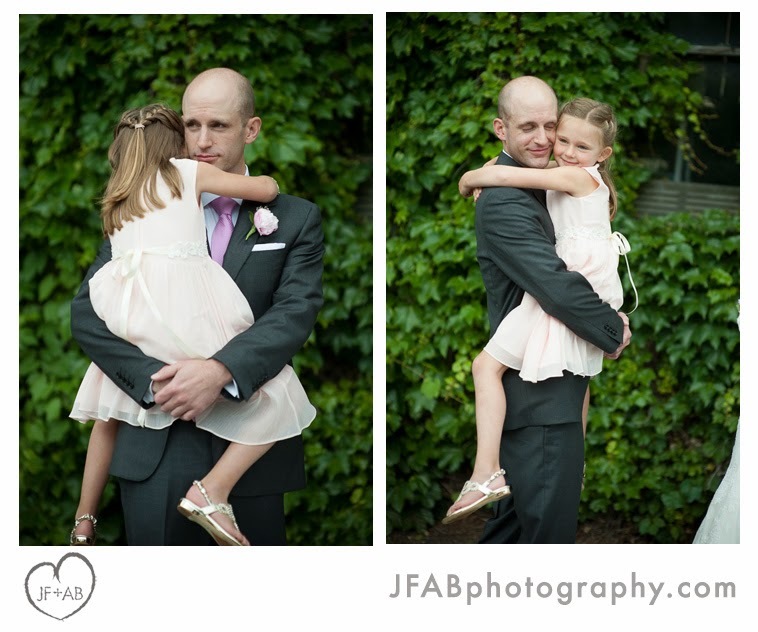 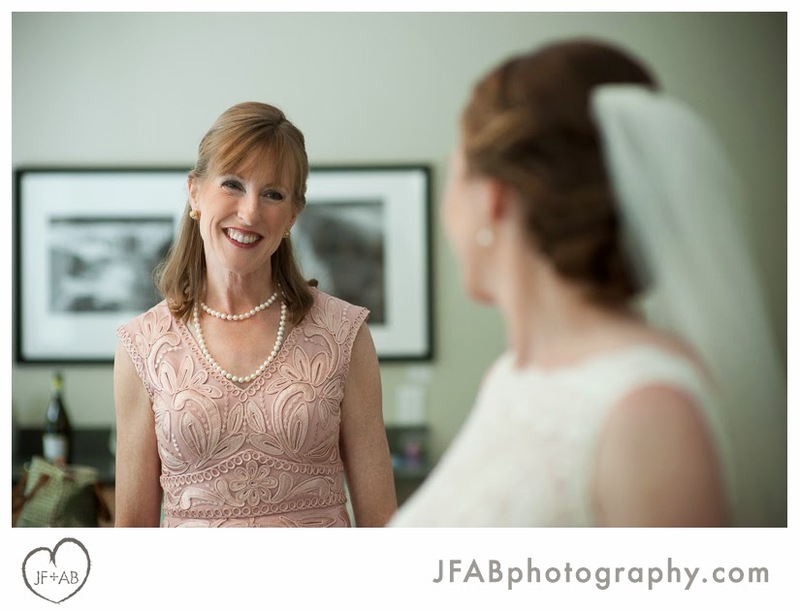 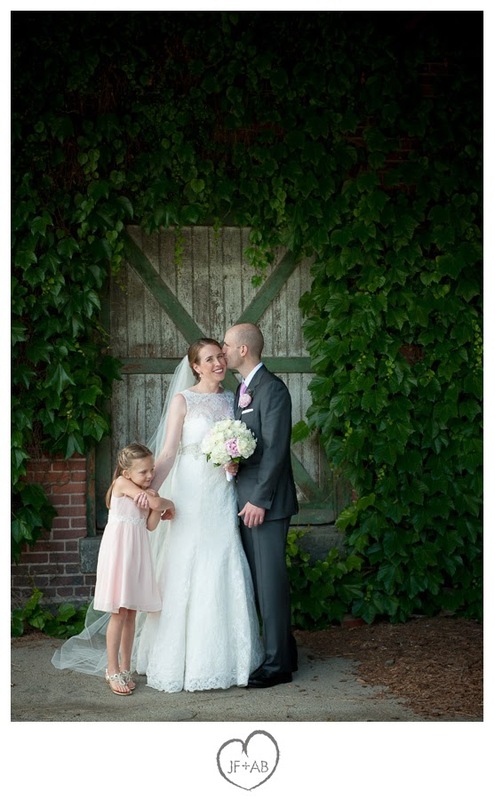 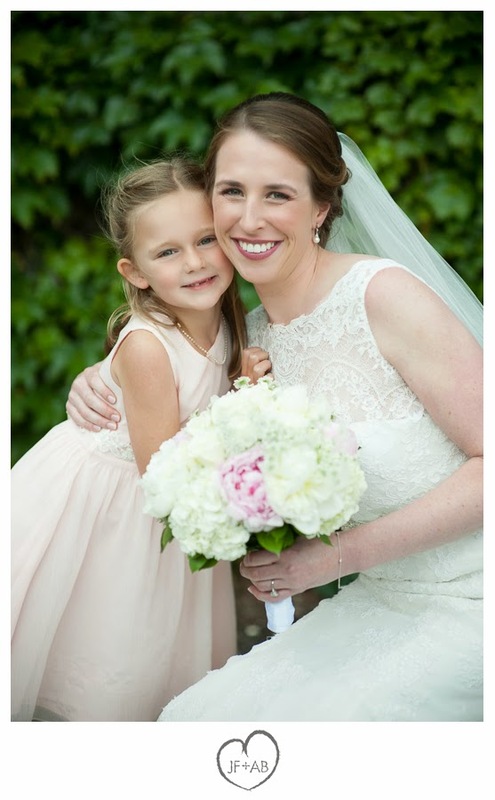 To capture this special relationship, we planned to have Charlotte join us for photos prior to the wedding at the end of Julie and Ben's first look portraits. 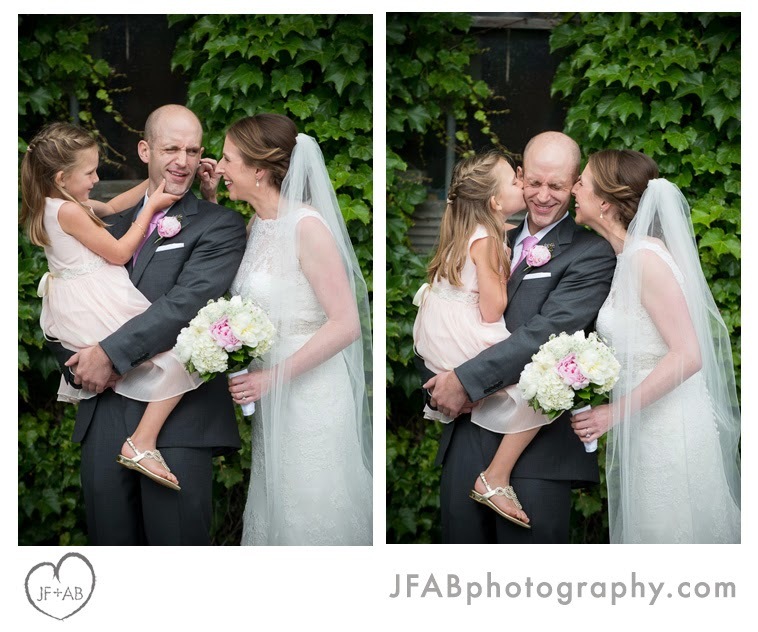 The photos that resulted are some of my favorite from the day. 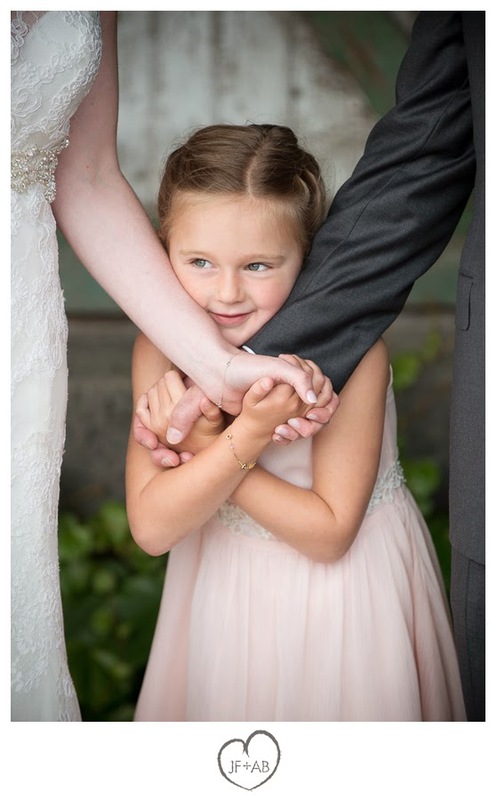 The three of them together are very sweet! 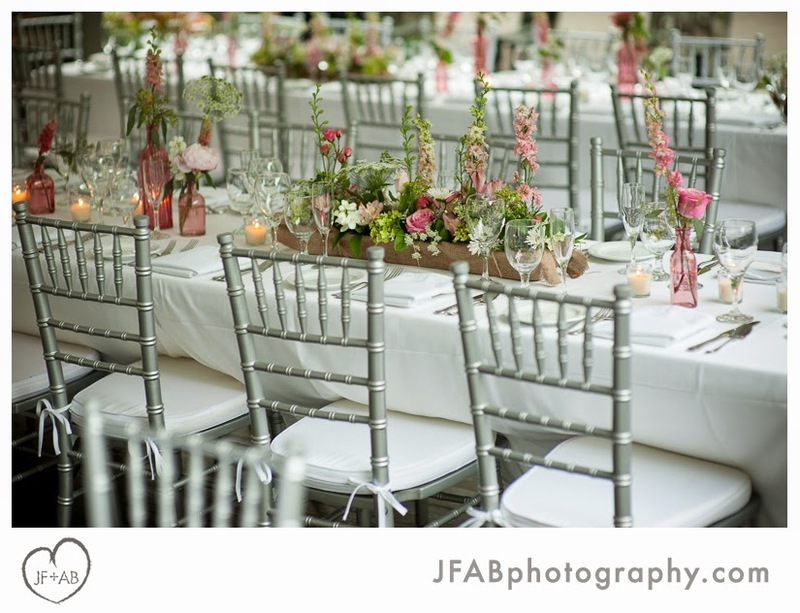 The reception table settings were beautiful. 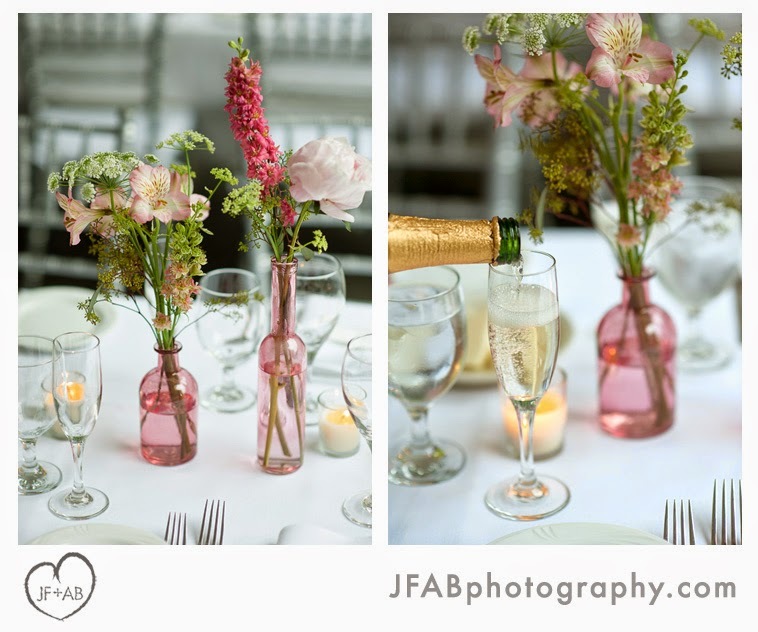 I loved the vintage pink glass vases that Michael provided for the table center pieces. 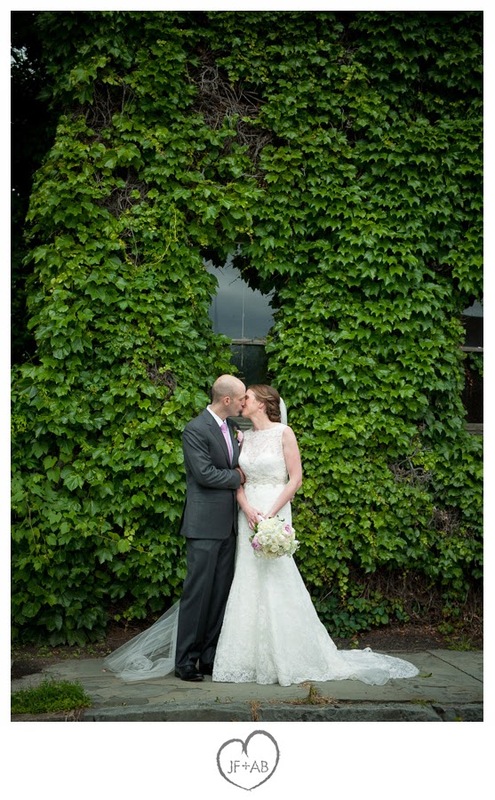 And his flowers were amazing! 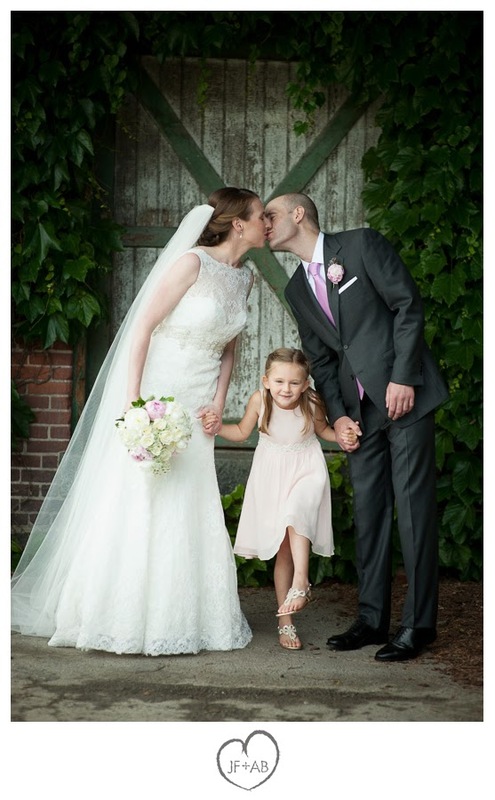 I loved how the flowers that looked like daisies, queen anne's lace and pink day lilies made the otherwise formal arrangements feel like a fresh picked summer bouquets. 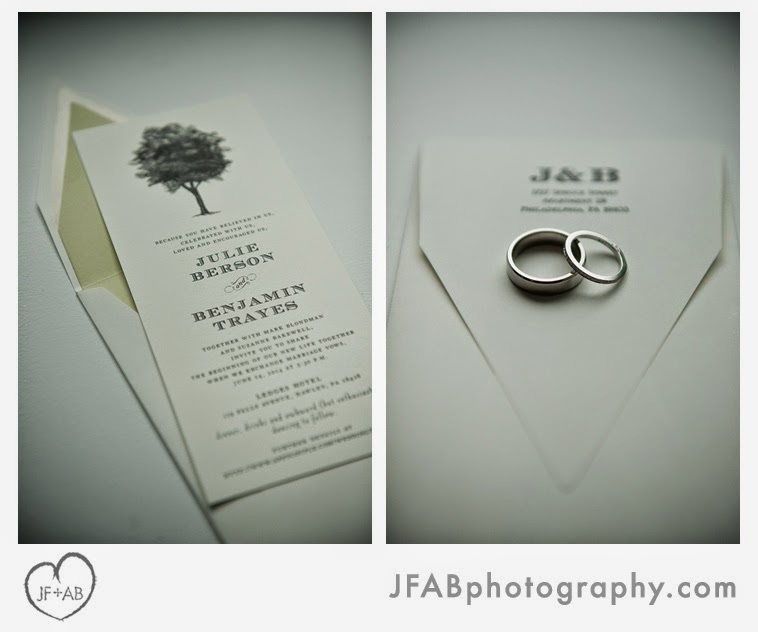 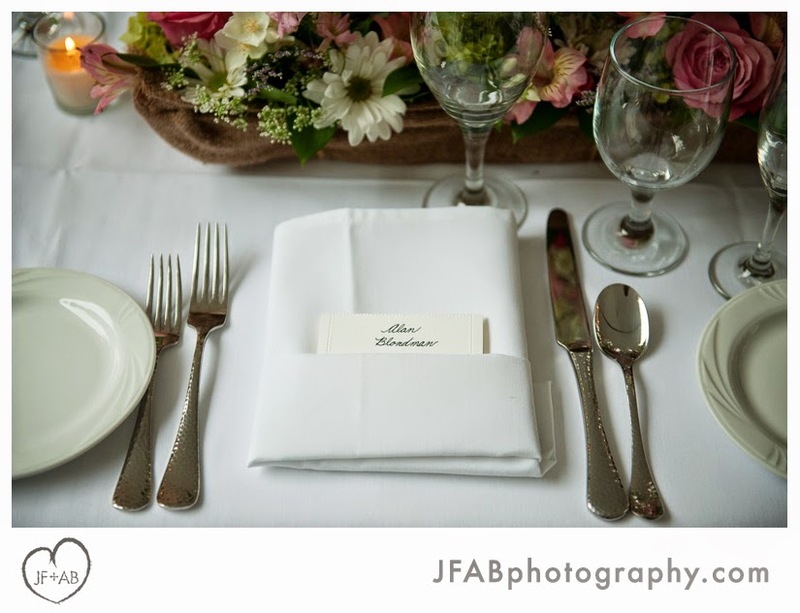 It was also a nice touch that the place cards were individually tucked into each guest's napkin. 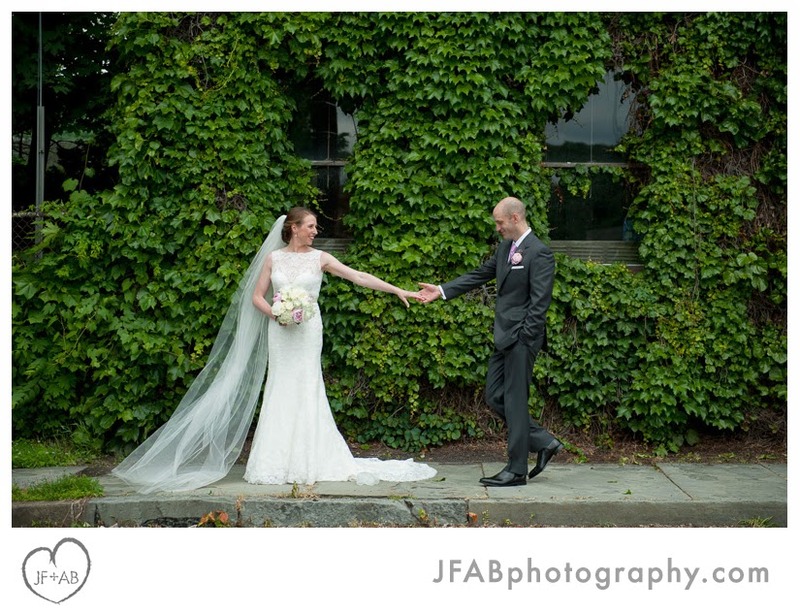 It truly was a beautiful day. 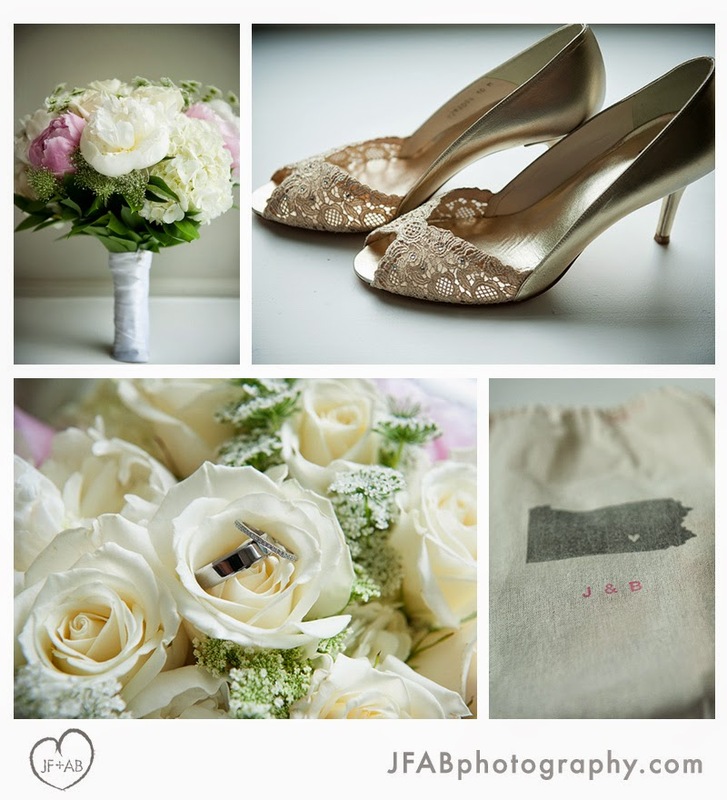 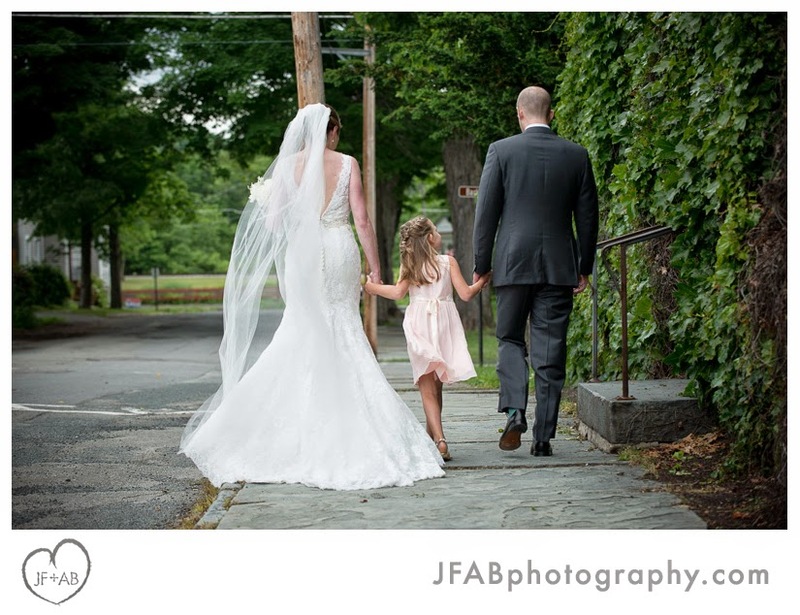 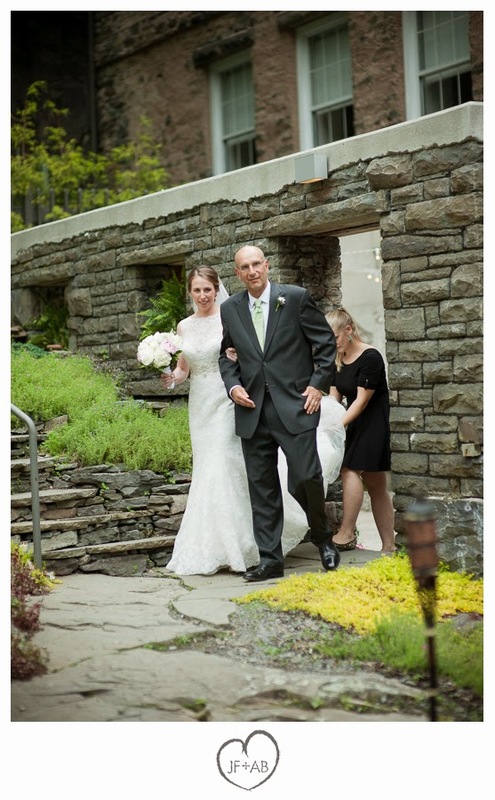 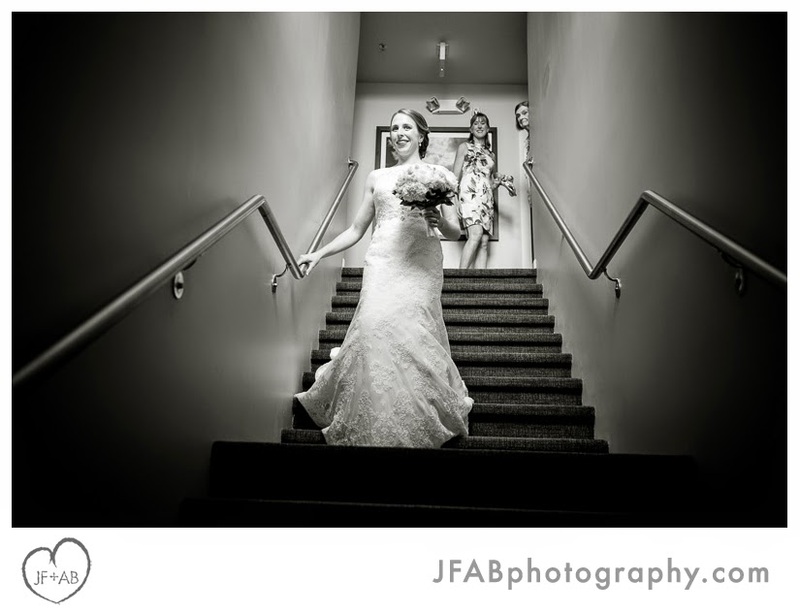 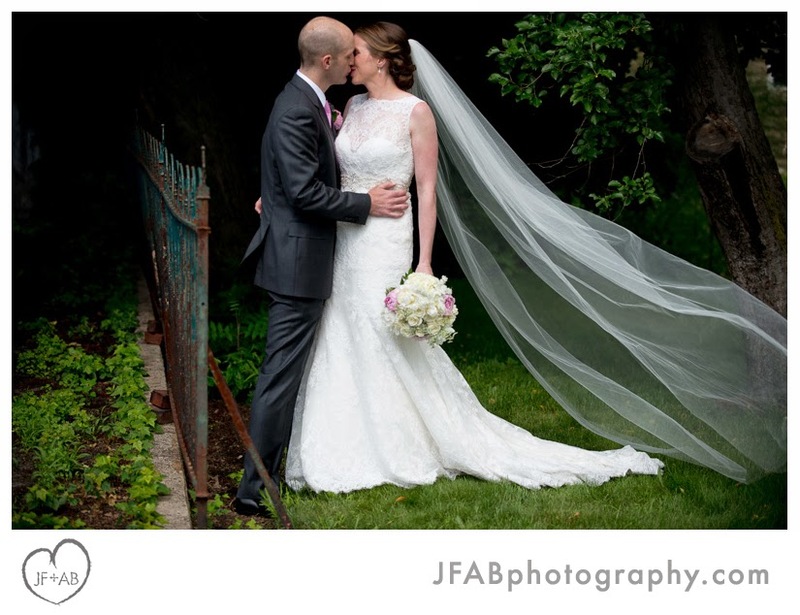 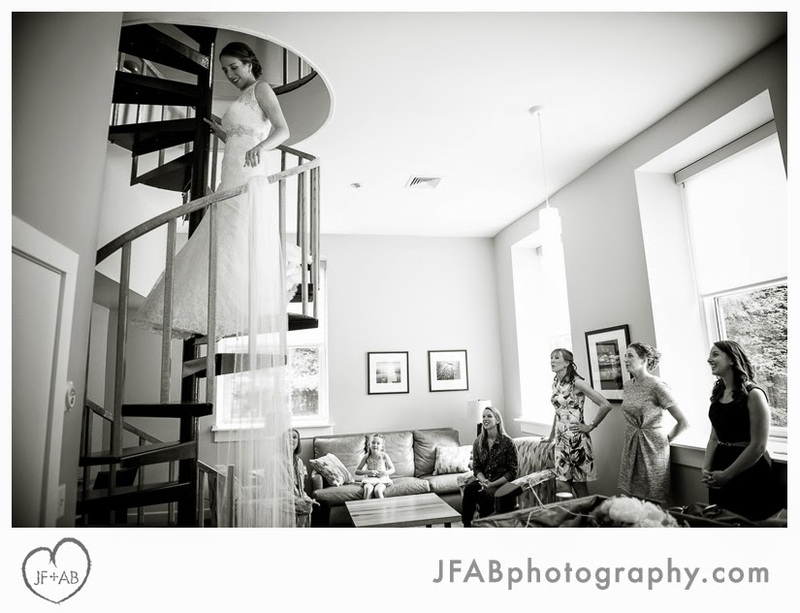 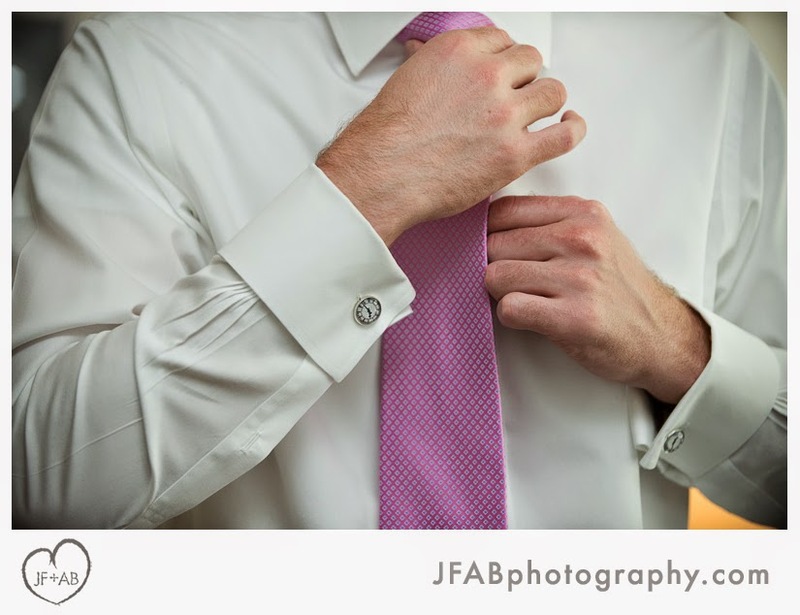 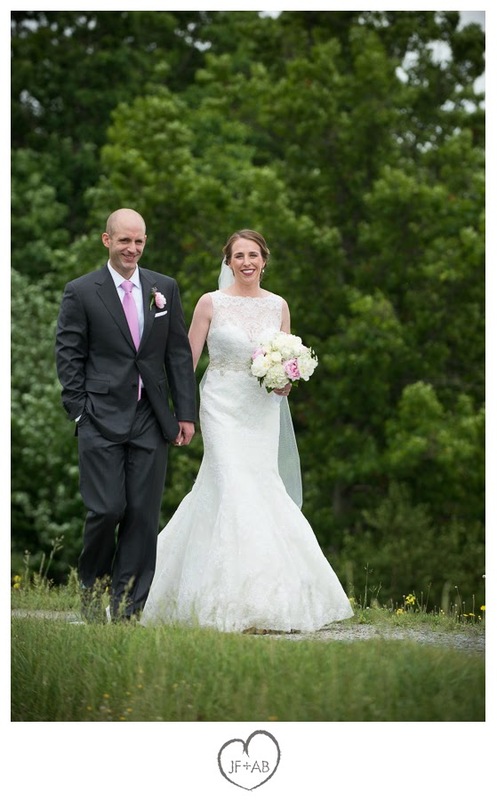 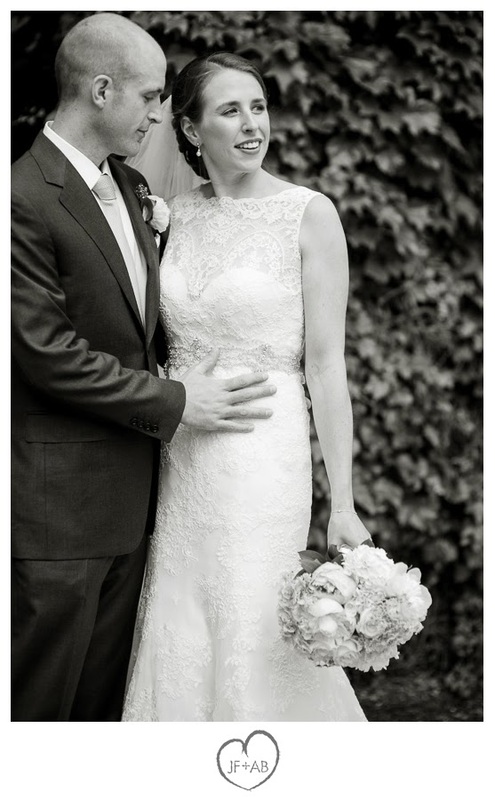 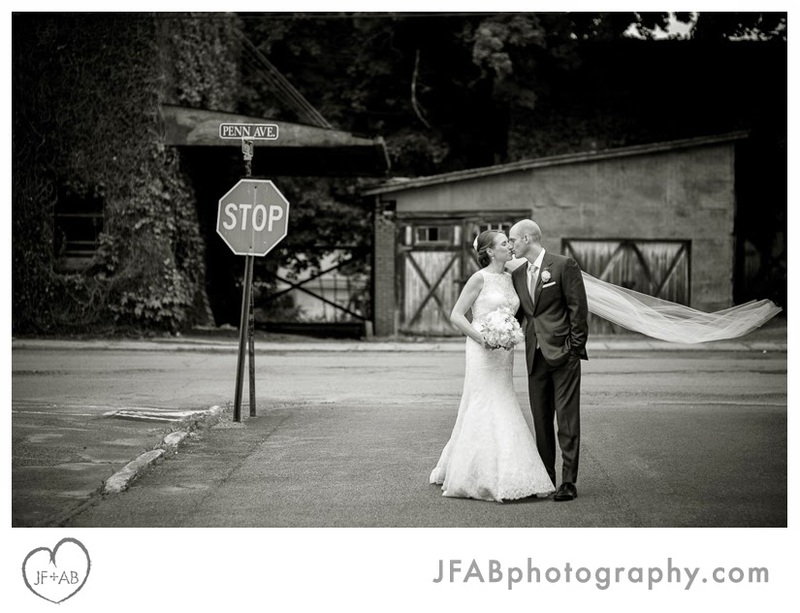 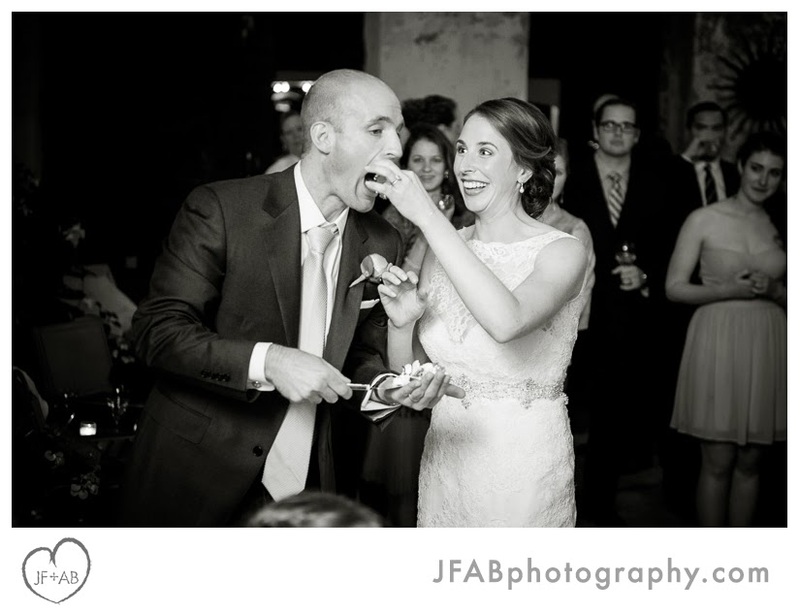 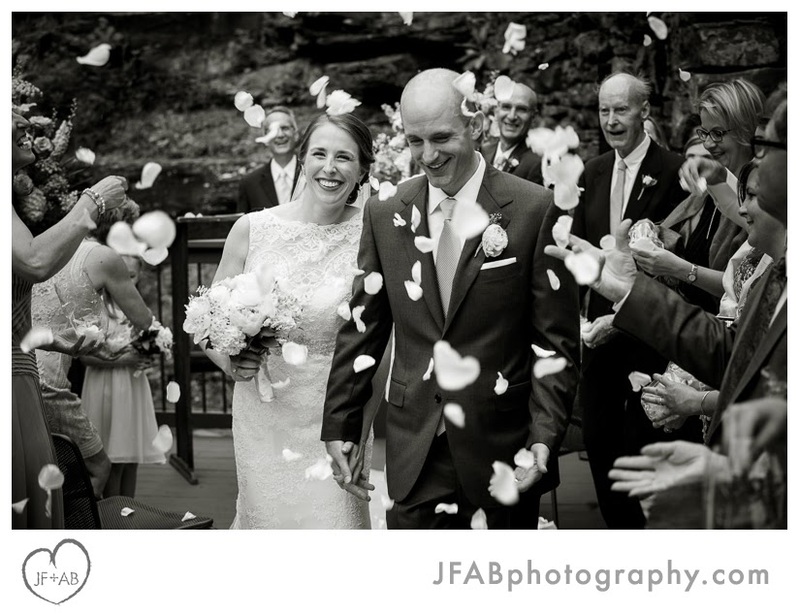 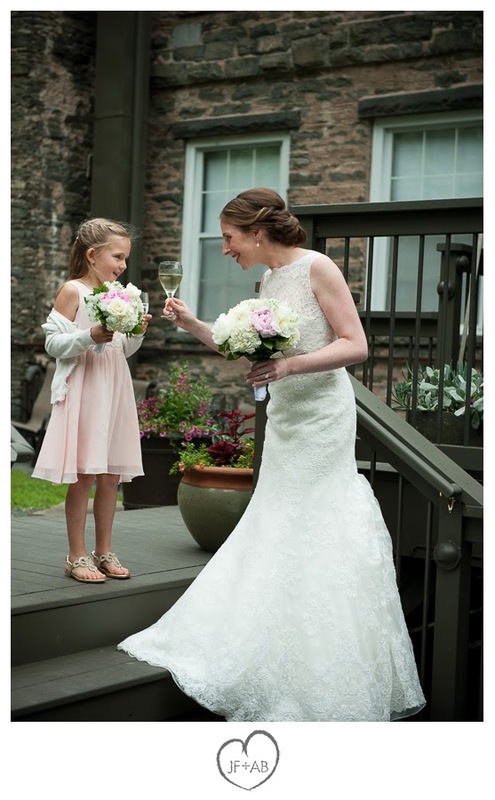 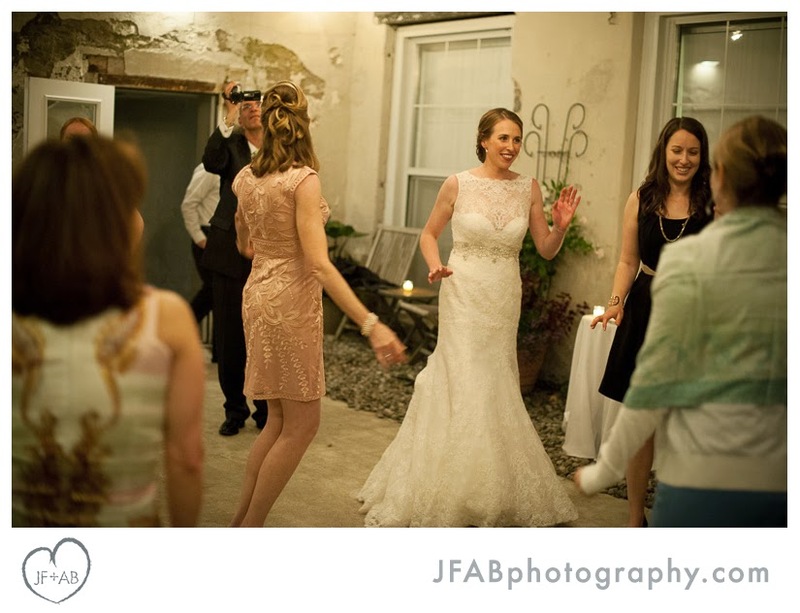 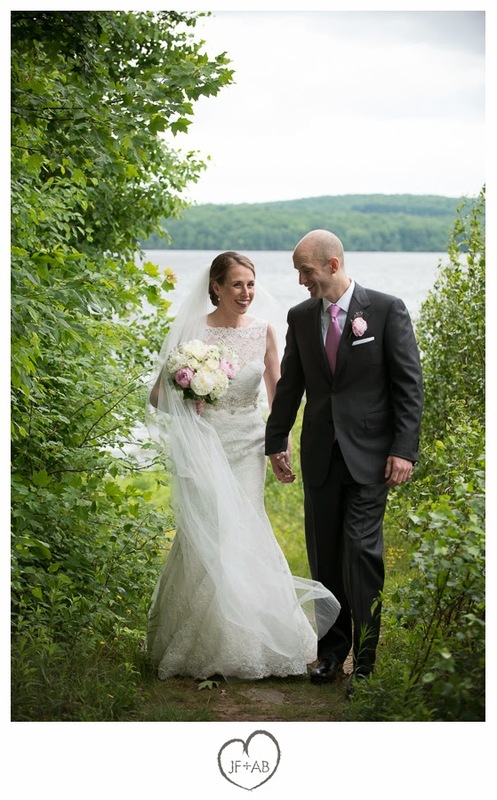 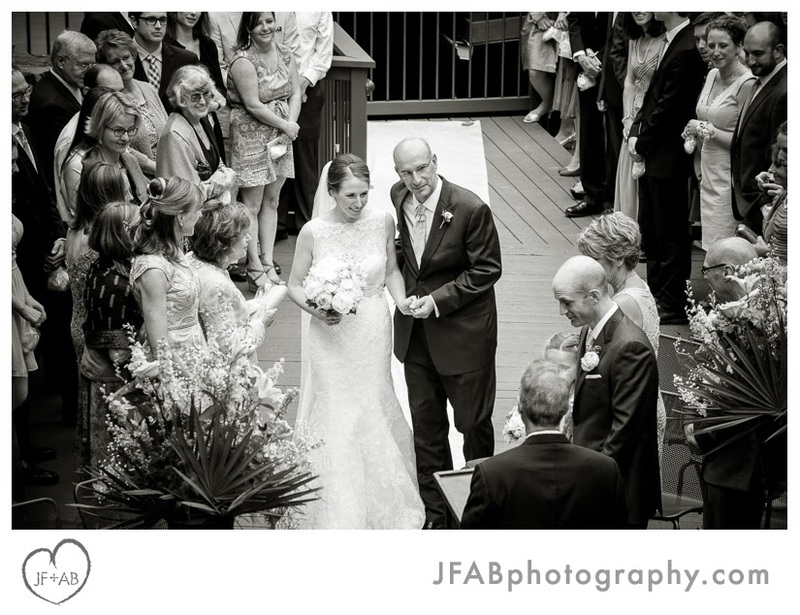 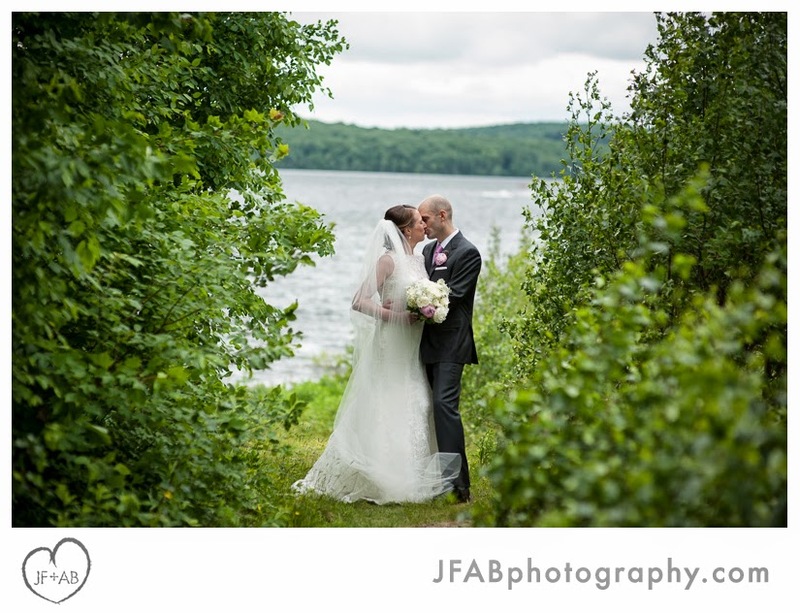 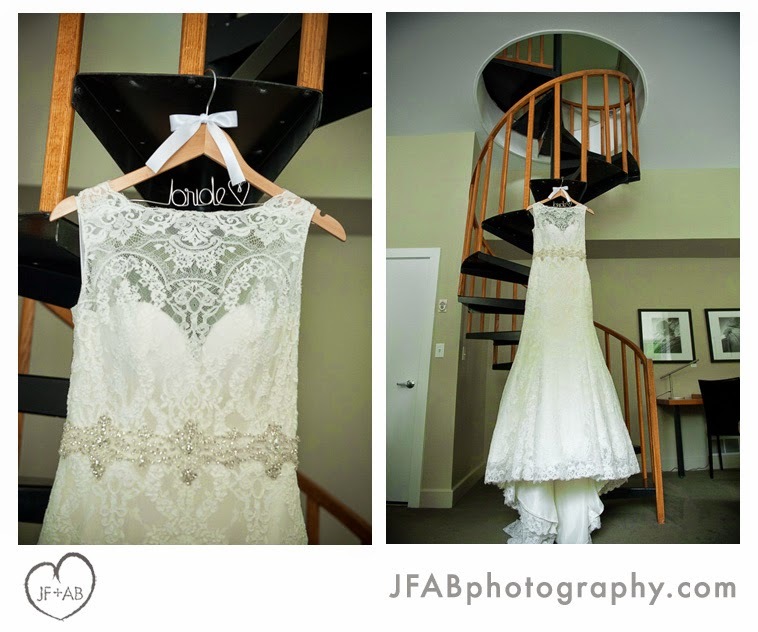 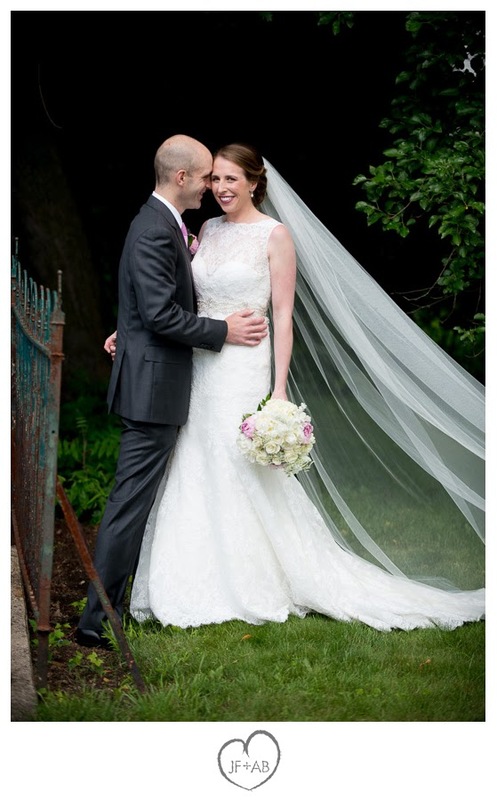 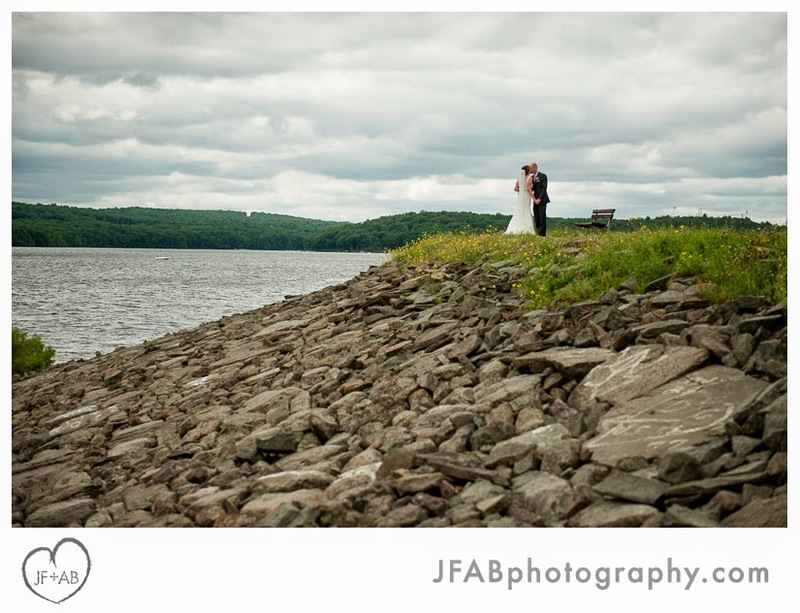 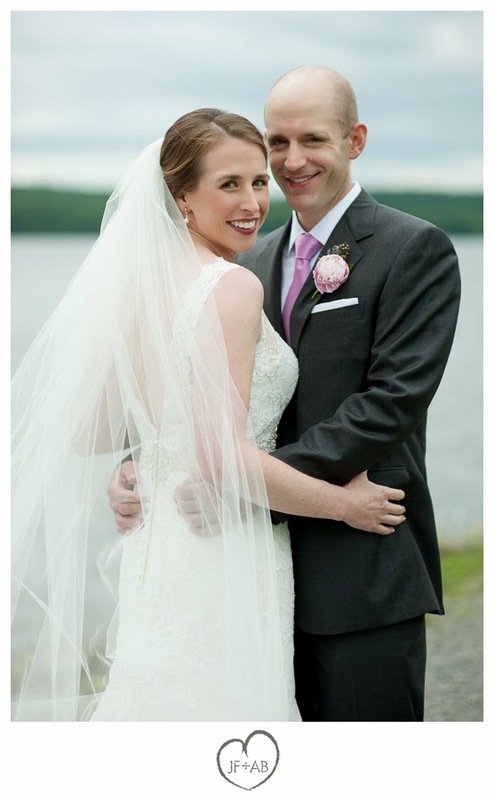 From the getting ready action in the modern, simple rooms of Ledges Hotel, to Julie and Ben's first look on the banks of Lake Walenpaupack and following portraits in downtown Hawley. 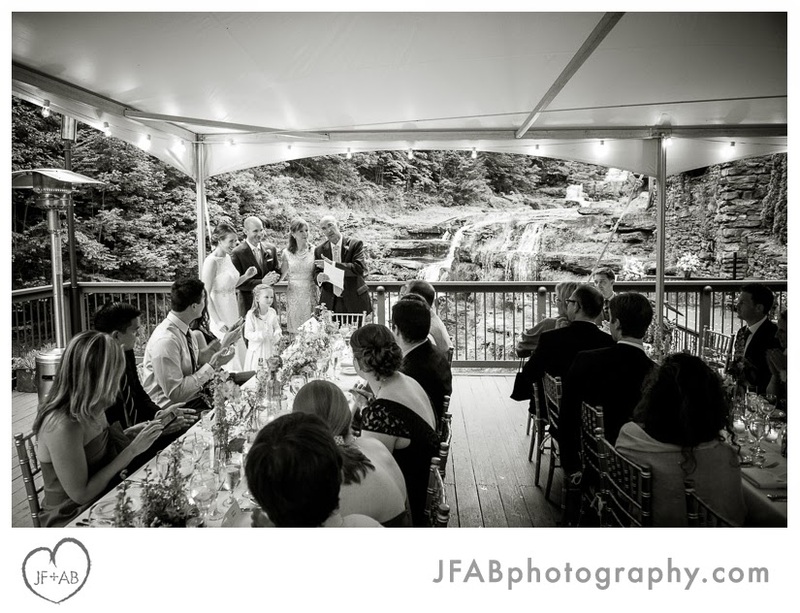 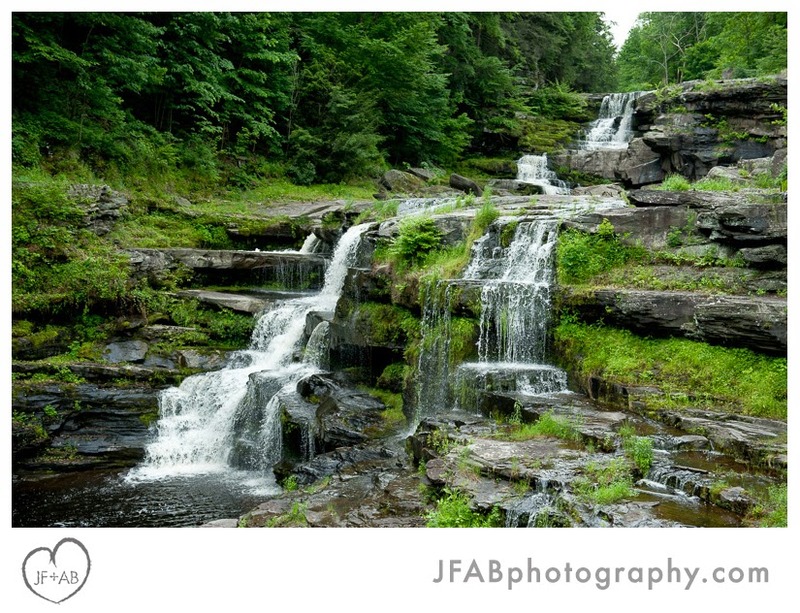 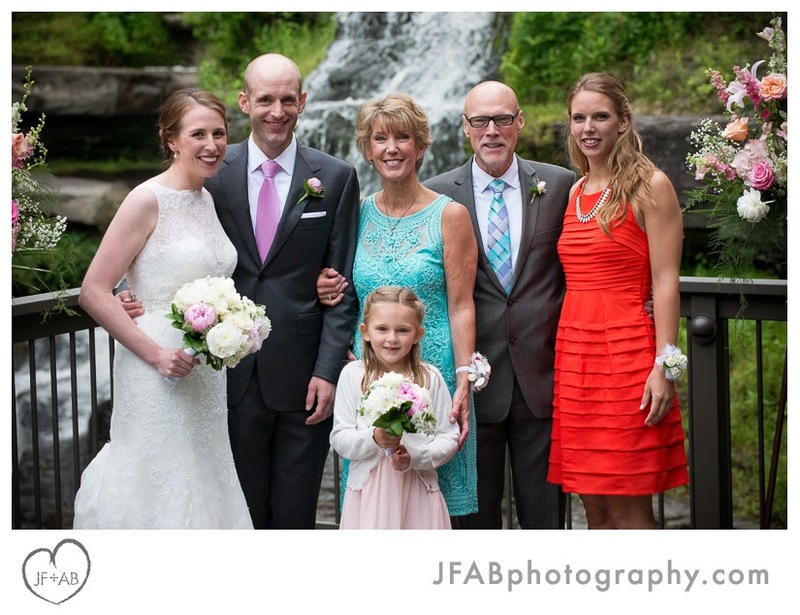 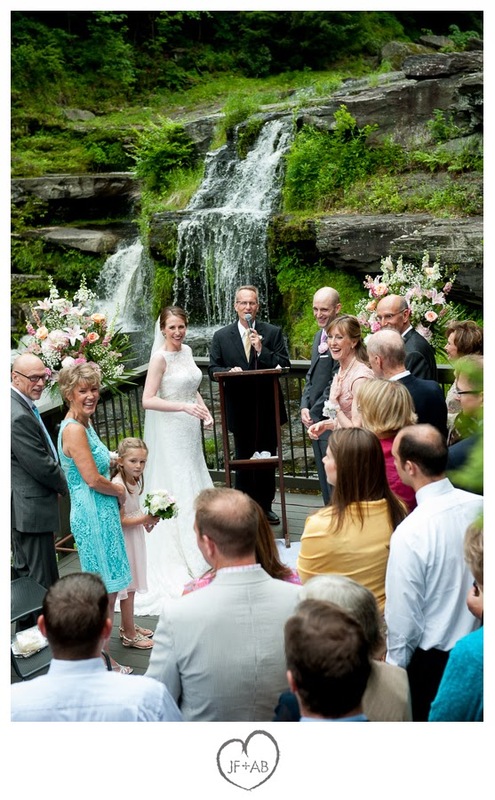 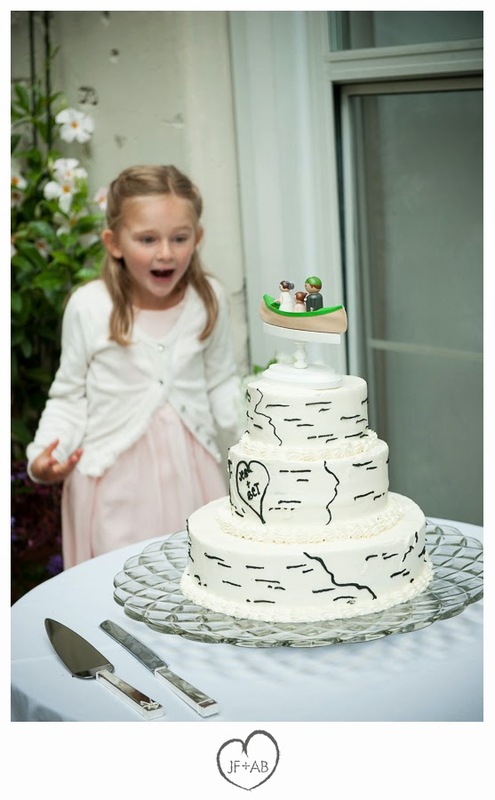 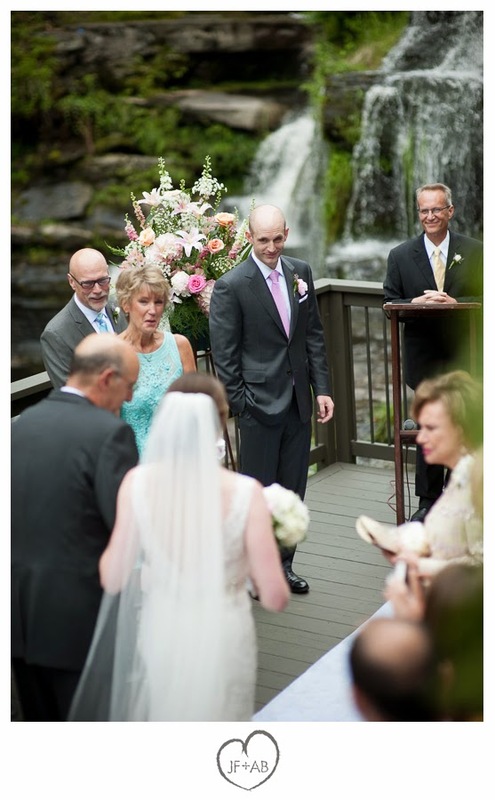 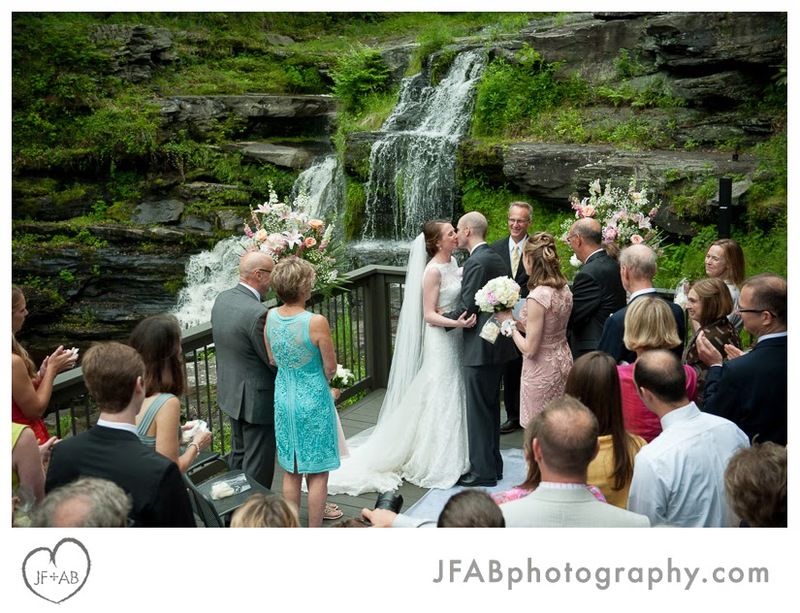 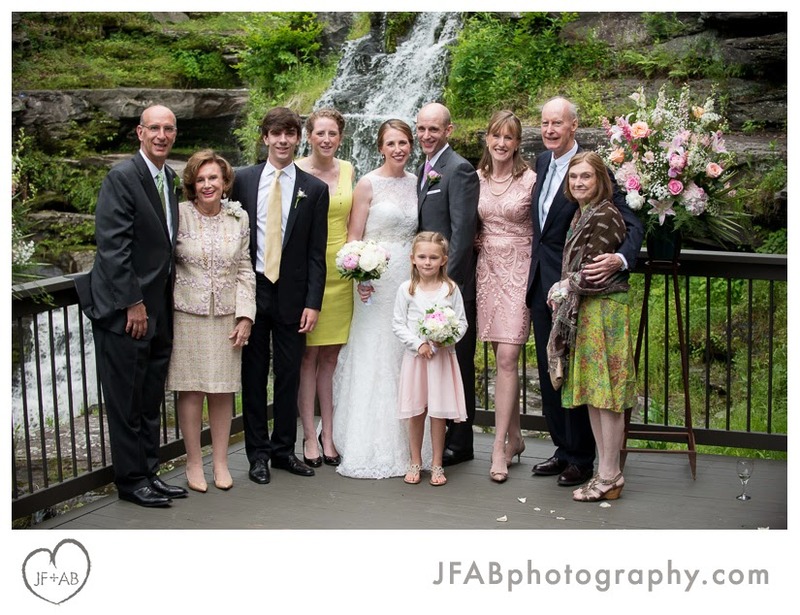 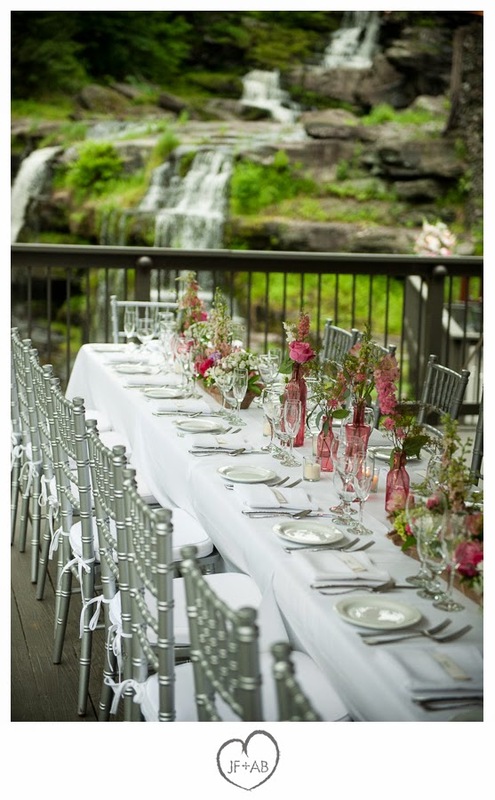 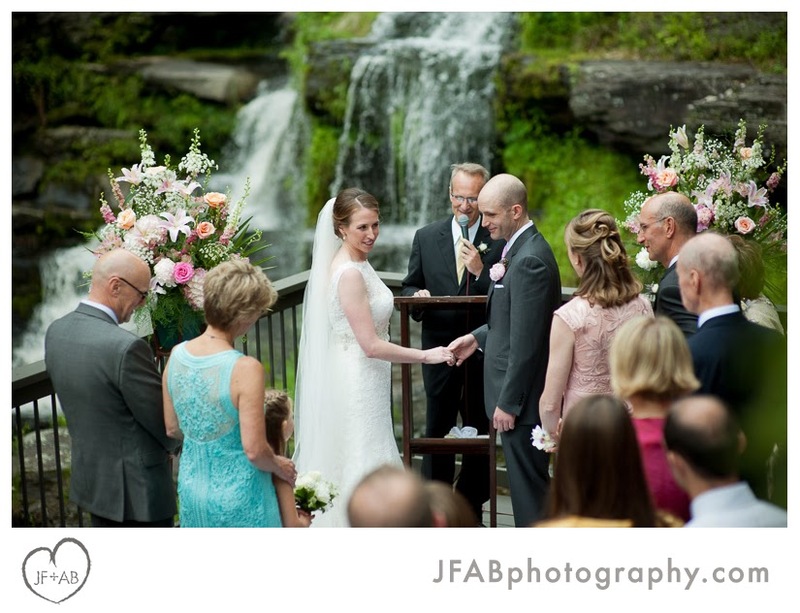 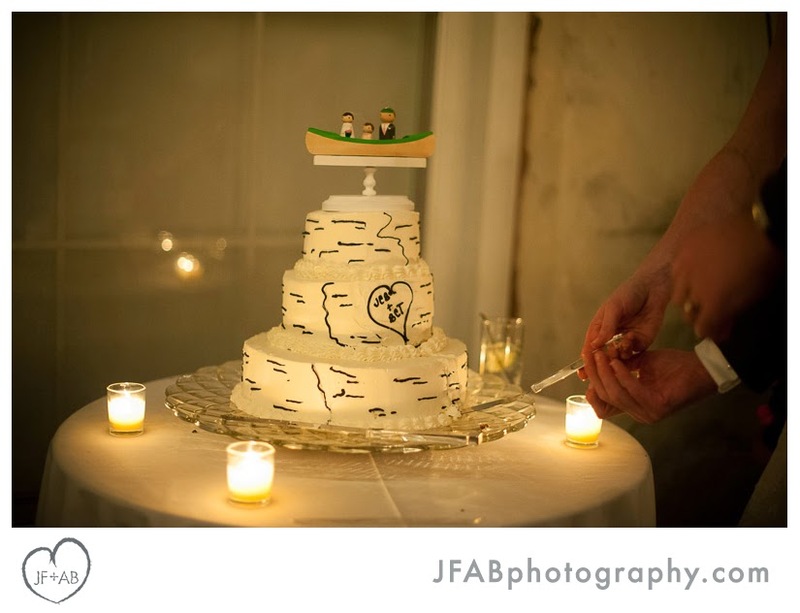 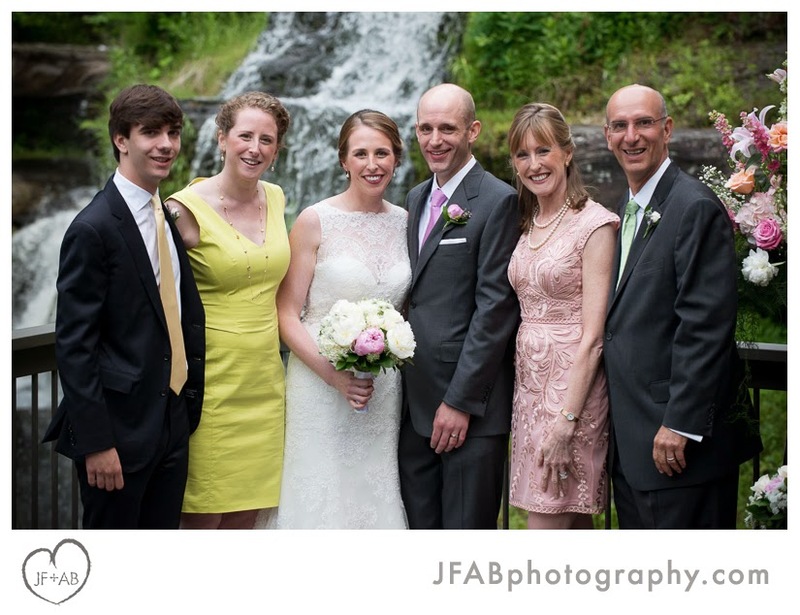 From their ceremony in front of the waterfall (good call on orienting the ceremony in the left corner Julie! 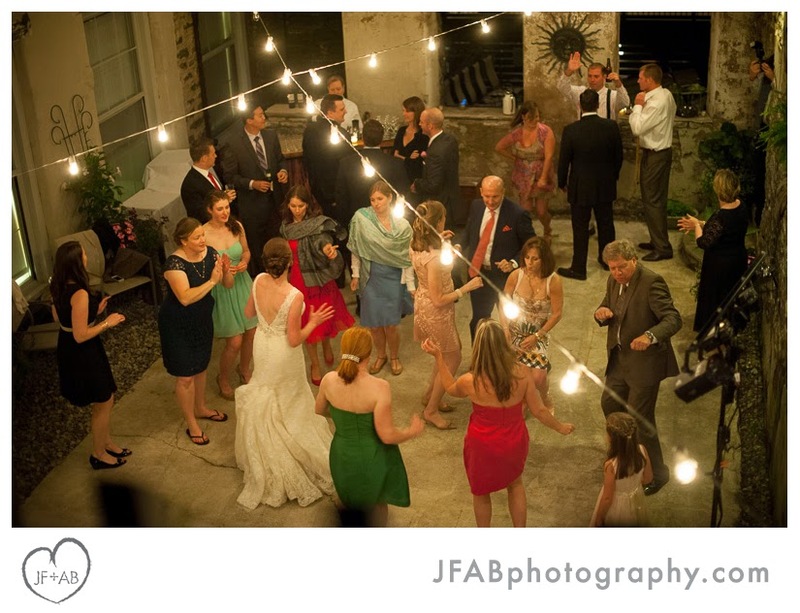 ), through the amazing dinner and Edison-light lit dance floor in the ruin. 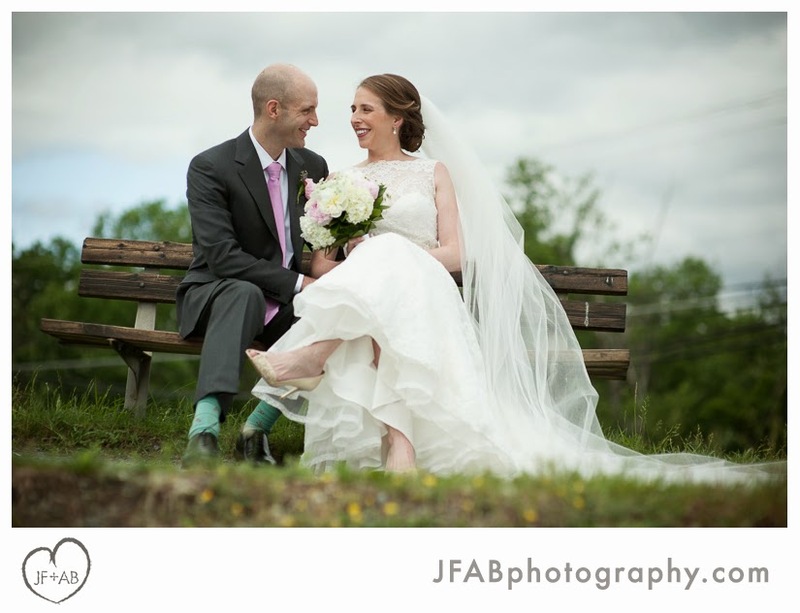 Scroll on to check out some of our favorite images from the day! 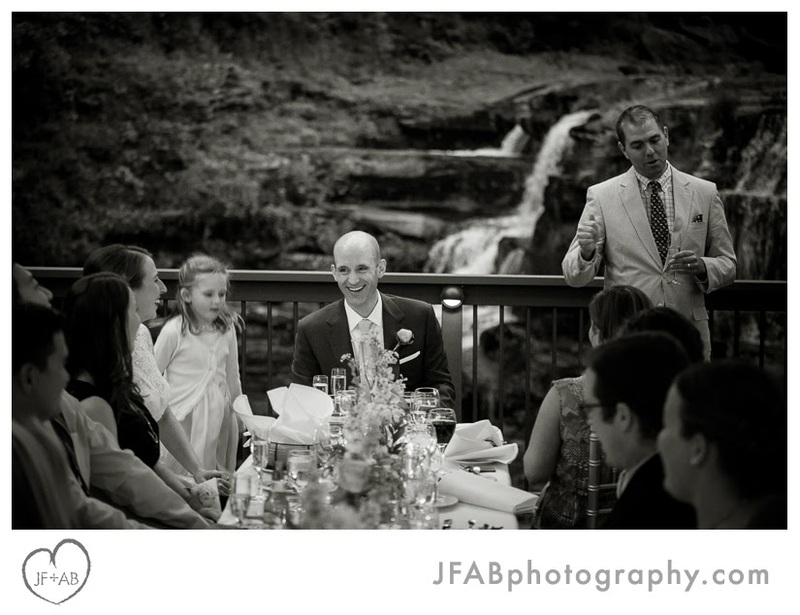 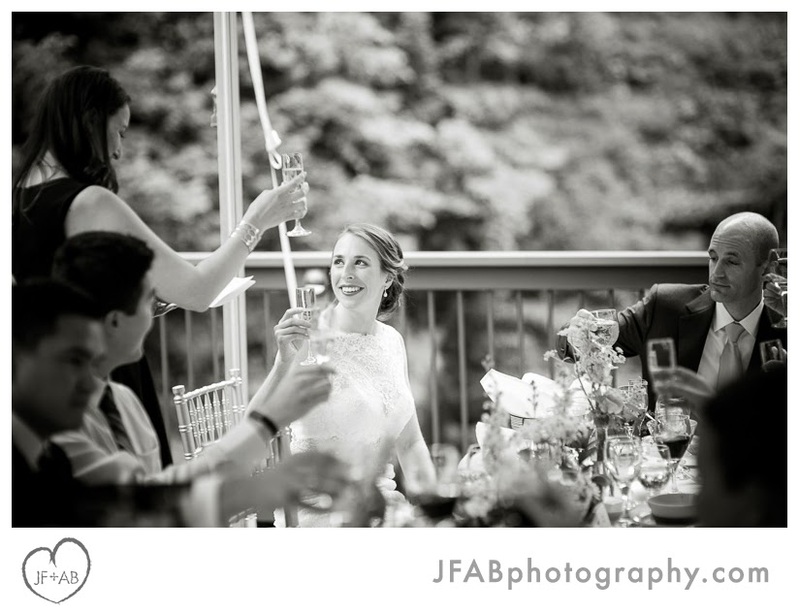 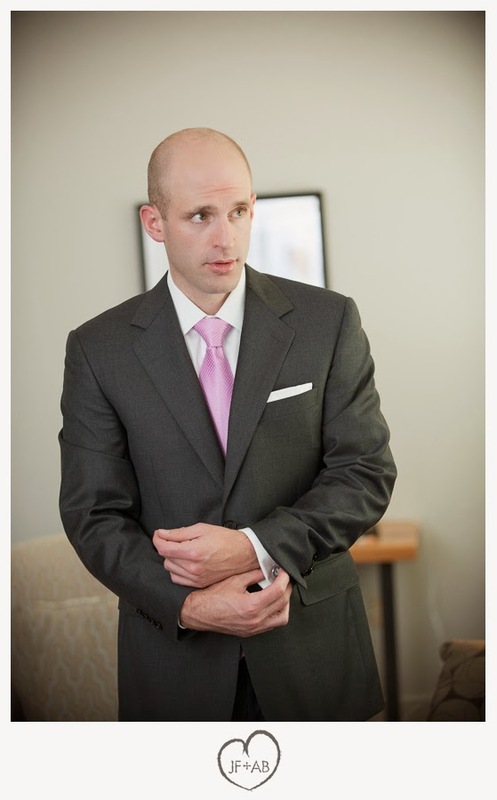 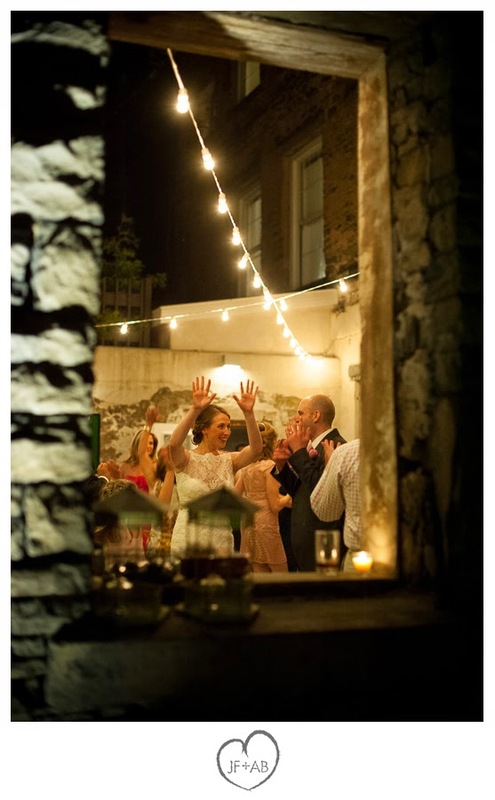 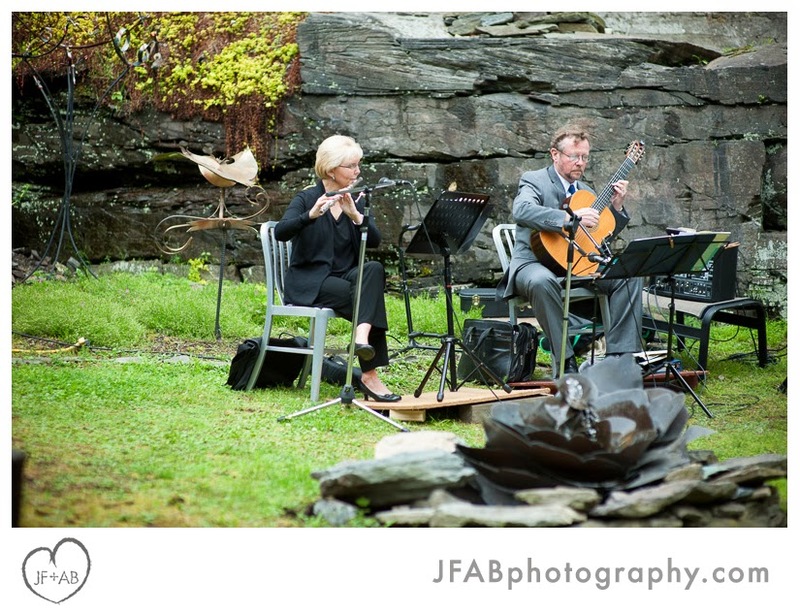 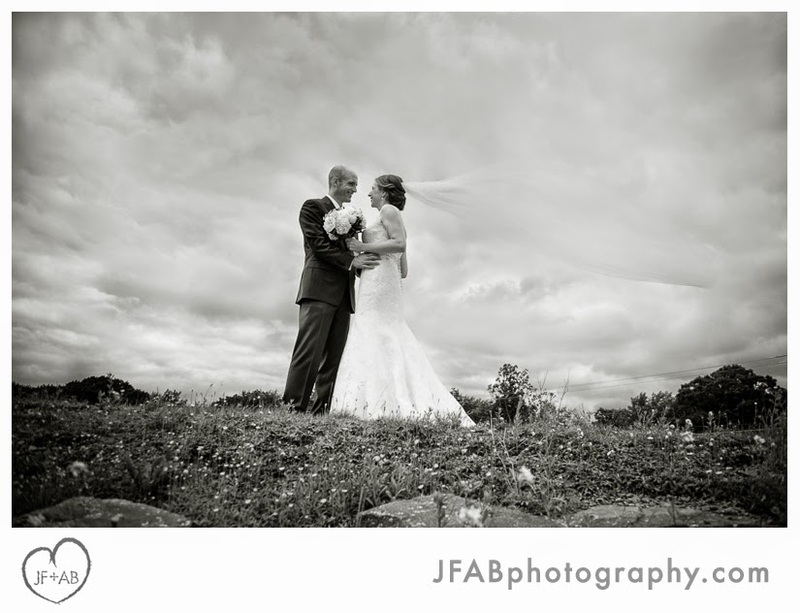 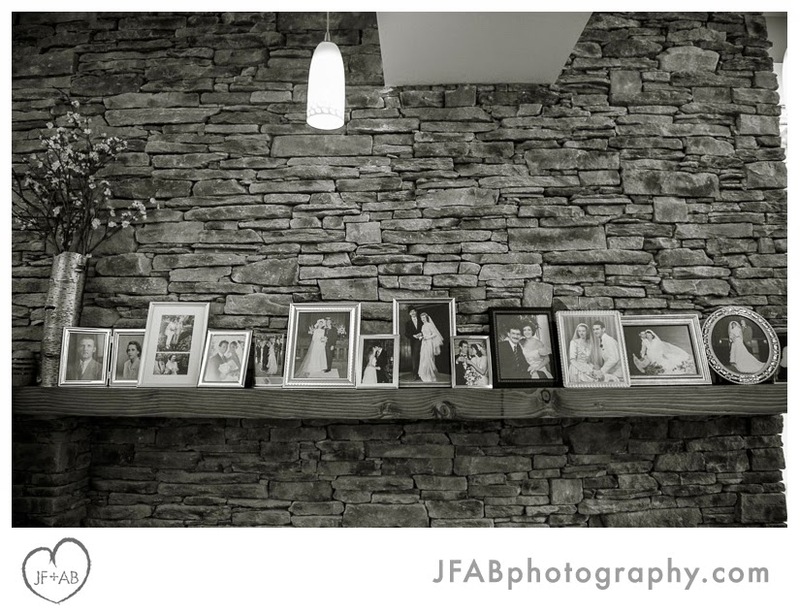 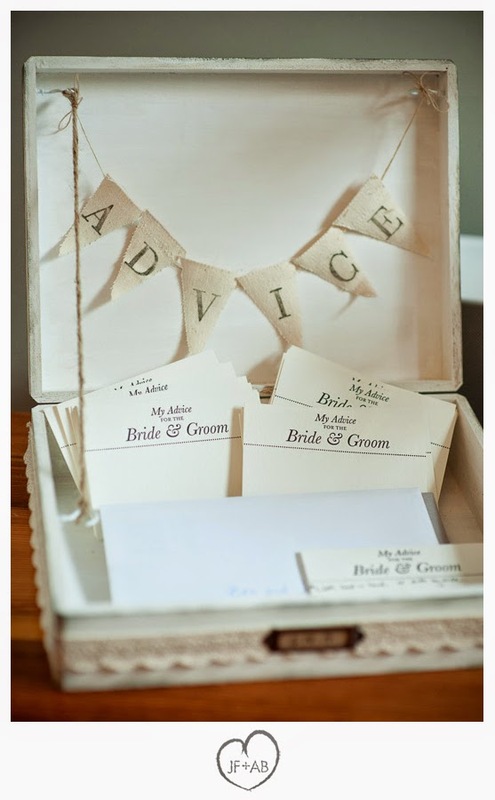 Credits: Wedding and Reception at Ledges Hotel. 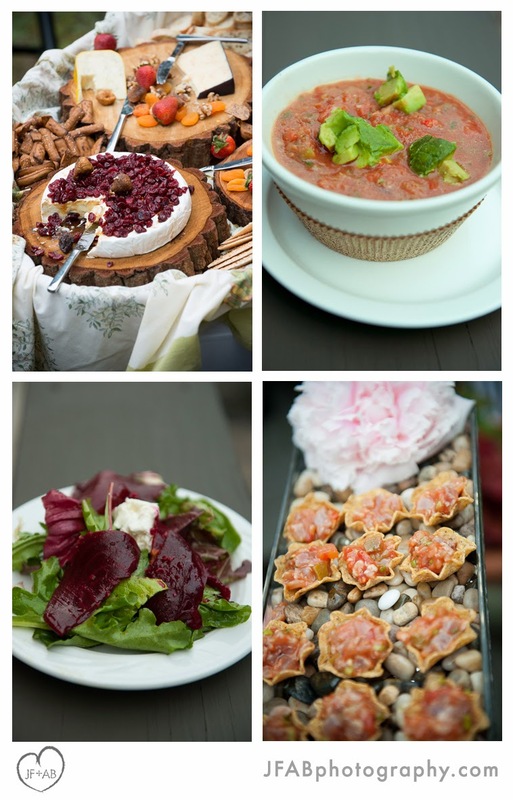 Catering by the Settlers Inn. 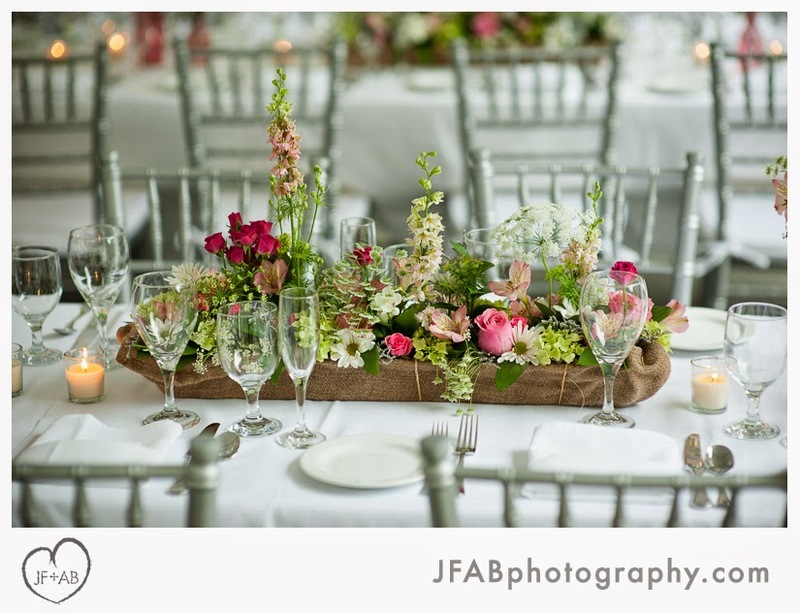 Wedding florals by Michael's House of Flowers. 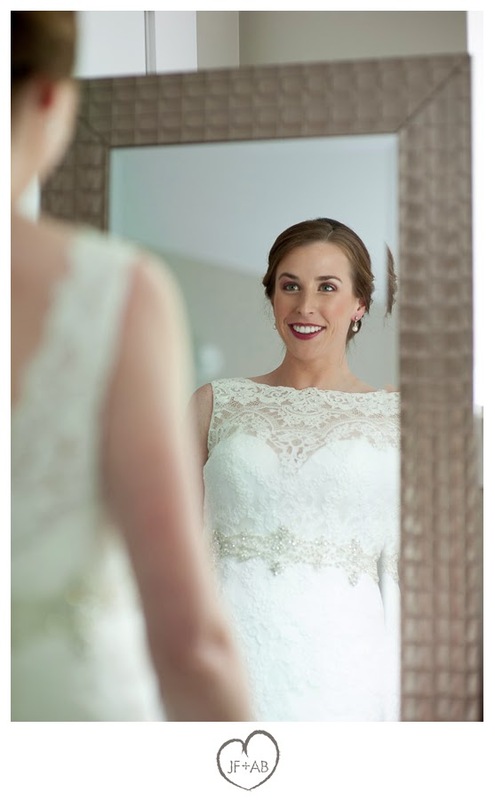 Hair and make-up by Utopia Salon. 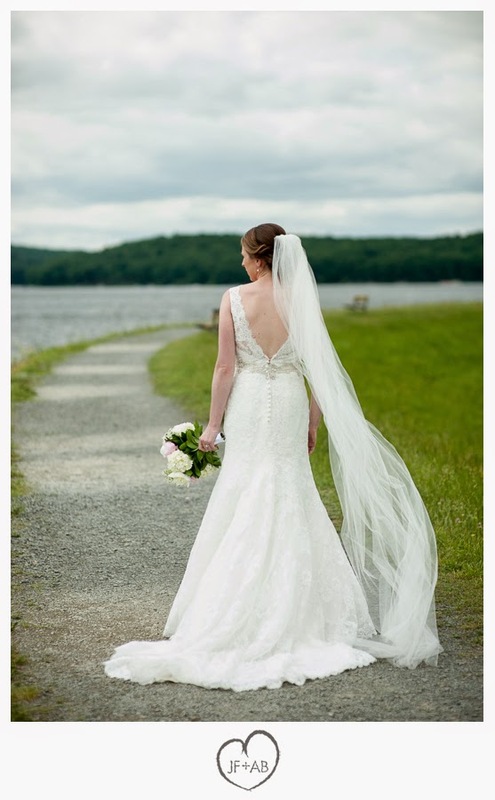 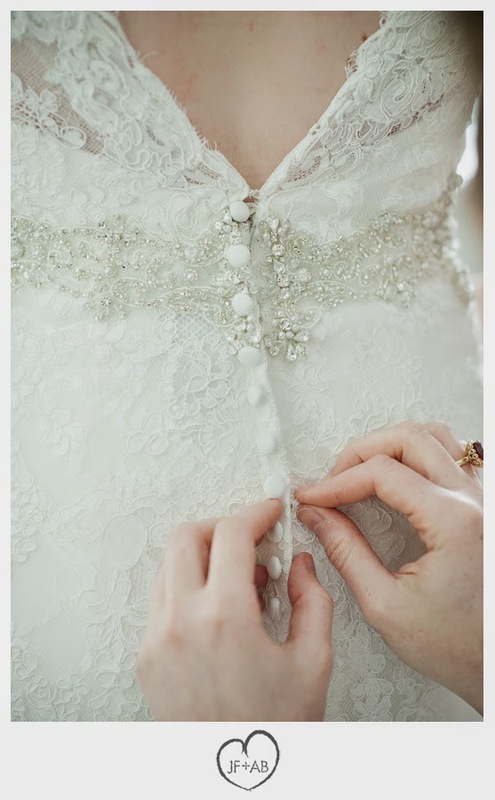 Bride's gown by Allure Bridals.